Just five players from outside the British Isles played in the inaugural Women's Super League in 2011. Now that number has risen to 27 and there are three Spain internationals at Arsenal Ladies alone. 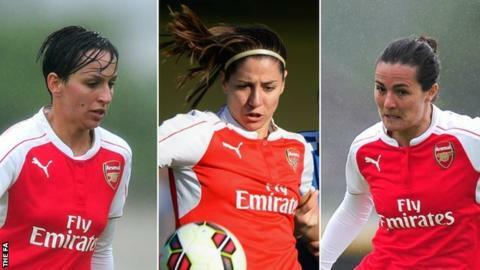 Heavily-decorated Iberian trio Marta Corredera, Vicky Losada and Natalia have found a home from home in Hertfordshire, working under compatriot Pedro Martinez Losa. But why chose the WSL and opt for Borehamwood over Barcelona? "We need to go out of the Spanish league to be better players," midfielder Corredera, 24, told BBC Sport. "I think the WSL is better than the Spanish league. There are fewer teams and I think (that) is better for the competition. "It is one of the leagues Spanish players need to look at because there are fewer teams and it's more competitive for us. "In Spain, there are a lot of teams in the league and I think that's not good for the players." The Football Association have big plans to expand the WSL gradually over the coming years and, with a salary cap in place, the intention is for steady, controlled growth. But that does not seem to be deterring oversees stars. "New players bringing something different to this league can help us grow," Arsenal boss Losa added. "Players coming to this league means that the league is a strong project." But how is that project perceived around the world? After all, German club sides have enjoyed far more success than English clubs in Europe and it is in America where players can earn higher wages. How do the English and Spanish top flights differ? "I think it has been a real model," Losa continued. "It is a good model of organisation, a real good example of investment in women's football and believing in it, starting from the FA to the clubs and the media and the fans. "The players in women's football sometimes they play for something else - not just the salary, they play for recognition as a women's athlete. "The players want to be here, to work for a big club, to be part of a strong project and to be in a good moment in the history of women's football." One player who could yet stake her claim in Arsenal Ladies' illustrious history books is Corredera, who joined Losa's side from Spanish champions Barcelona earlier this summer. Since arriving in Hertfordshire, she has become an instant favourite with Arsenal fans and recently netted a brace in a 2-0 Continental Cup win at rivals Chelsea. "We have to give her credit, to come a new league, a new group and a new environment and and adapt so quickly," Gunners manager Losa said. "She wanted to be here so badly, for the club, the manager, for her team-mates. I think that's something she is showing on the pitch." Undoubtedly, playing alongside two compatriots has helped Corredera settle in at Arsenal. "We've been playing together for a long time in the national team, which is great, and I think its very helpful for us to have another two Spanish players playing with you," striker Natalia, 29, added. "I think we have a different style from England players. I think we help each other because England is more physical and we have maybe more technique. "Its a good mix for the team, and we try to help the team with our style." Midfielder Losada, 26, added: "Spain can be more tactical and more technical. "I think we can get the team to play different football, more relaxing football and I think it will be good for the team." Marta Corredera, Vicky Losada and Natalia are the only Spanish players to feature in Women's Super League so far this season. Another Spaniard, Cristina Torkildsen, has been named as an unused substitute for Birmingham City in the WSL but is yet to make a league appearance in 2015. It is clear that the chance to work under Spanish boss Losa played a big part in all three players' move to Arsenal. "When I had to decide my future, Pedro was a big influence for me, to come to Arsenal," Losada, who worked with Losa at Western New York Flash, continued. "I know him and his work, and it is good for me. He is a really competitive man. "He always wants us to improve every day, to become a better players and a better people. "He understands the mentality of Arsenal, on the pitch as well as off the pitch. That's all the things I want as a person and a player." Former Rayo Vallecano star Natalia, who joined Arsenal after a spell at Bristol Academy, added: "Pedro knows everything about football. The most positive thing is he knows how to get the best out of his players. "Pedro is very demanding. He is helping a lot with his knowledge. He knows about American, English and Spanish football. I think that's a good combination to teach players." Between the three of them, Natalia, Corredera and Losada have won 20 major trophies in Spain. What can they add to their impressive careers while at Arsenal? "We are looking to Europe and the Champions League, and they believe in those projects here," Losa added. "Hopefully in the future we can play in the Champions League."